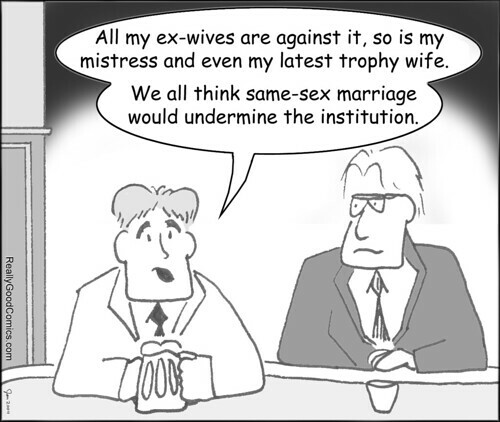 This comic, and the one below were part of a political brochure explaining the Christian case for Traditional Marriage: one man, one woman, for life. There were a lot of political types at the time arguing against Gay Marriage, but most often their arguments were superficial, or simply wrong. ("Gay Marriage is wrong because it's unnatural" Really? The same was once said about human flight - "it just ain't natural!" So this just ain't a great argument.) A Christian case for real Marriage needed to be made, and that included acknowledging that the current way heterosexuals were treating Marriage was hardly the way things were meant to be either.